This week’s photo is from the Cambrian Bliss Sandstone in the Franklin Mountains of westernmost Texas. The greenish material is glauconite … an authigenic mineral that typically forms in marine shelf settings, thought to reflect very slow sedimentation rates. 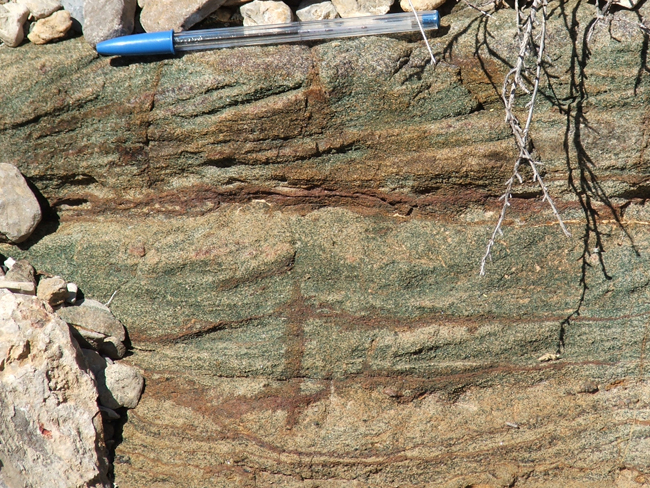 In this example, the glauconitic sandstone is actually reworked material (note the cross stratification). That’s a great photo of a real, live, green outcrop! Glauconite is great, never to be confused with glaucophane, a bluish mineral. Hello, stumbled across your photo while looking for an image of some reworked seafloor sediment. I’d like an example of how deep storm waves rework sediment up to 200 m deep, but generally reflect little net sand transport. Found this, assumed it was reworked by wind, but since the glauconite indicates a marine environment, I thought I’d take a chance and ask for more on this rock’s history. I’m assuming it was deposited in a nearshore environment (hence, sandstone) but thought you’d either have insight or suggestions.